Georgia O’Keeffe was one of the greatest artists of the twentieth century. She was known for her flower canvases and southwestern landscapes. She studied at the Chicago Institute of Art. O’Keeffe was a pioneer of modern art. 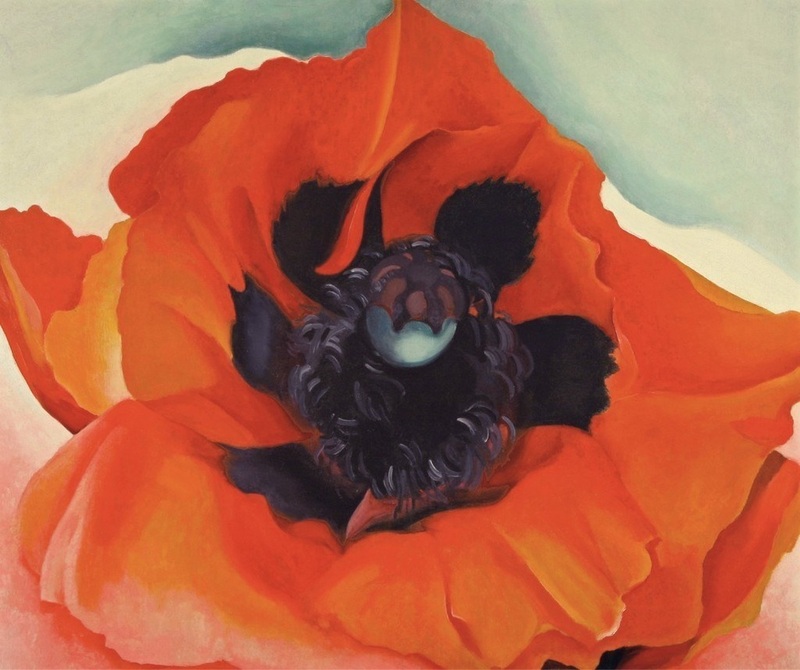 Georgia O’Keeffe painted Red Poppy in 1927. 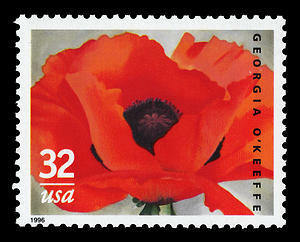 Ten years after her death at age 98, Red Poppy was featured on a U.S. postage stamp in 1996. Red Poppy, which is typical of her large scale flower paintings, is our painting of the week. 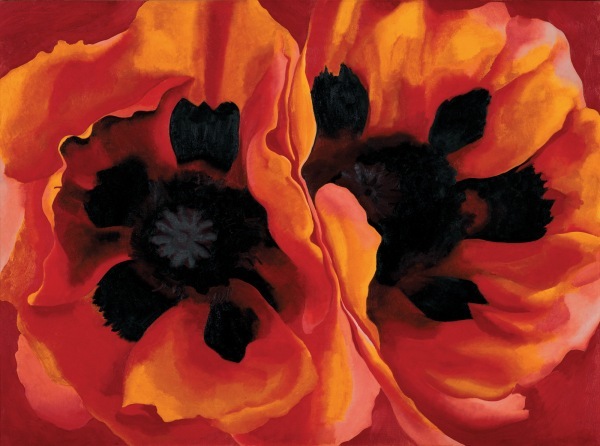 ​O'Keeffe painted at least seven paintings of poppies. Georgia O’Keeffe painted many large flower canvases. The flowers were depicted at close range which resulted in bold, abstract paintings that emphasized their colors and forms. O'Keeffe said, "​"When you take a flower in your hand and really look at it, it's your world for the moment. I want to give that world to someone else." Georgia O’Keeffe, Jimson Weed/White Flower No. 1 (1932). Sold for $44,405,000 at Sotheby’s American Art sale on November 20, 2014. In 2014, Walmart heiress Alice B. Walton paid $44.4 million for O'Keeffe's Jimson Weed/White Flower No. 1, making it the most expensive work of art ever painted by a woman. Alice Walton bought the painting for the Crystal Bridges Museum of American Art. In 1949, Georgia O’Keeffe made New Mexico her permanent home. The vistas and stark landscapes of the Southwest inspired her to paint them. ​She liked to collect rocks and bones from the area. She painted in oil until the mid-1970’s and later switched to pencil, watercolor, and clay creations in her old age. Georgia O’Keeffe has over two-thousand works in existence, and many are in collections all around the world. The largest collection of her works is in the Georgia O’Keeffe Museum in Santa Fe, New Mexico. The Georgia O’Keeffe Museum is the only museum in the United States that is dedicated to a female artist.